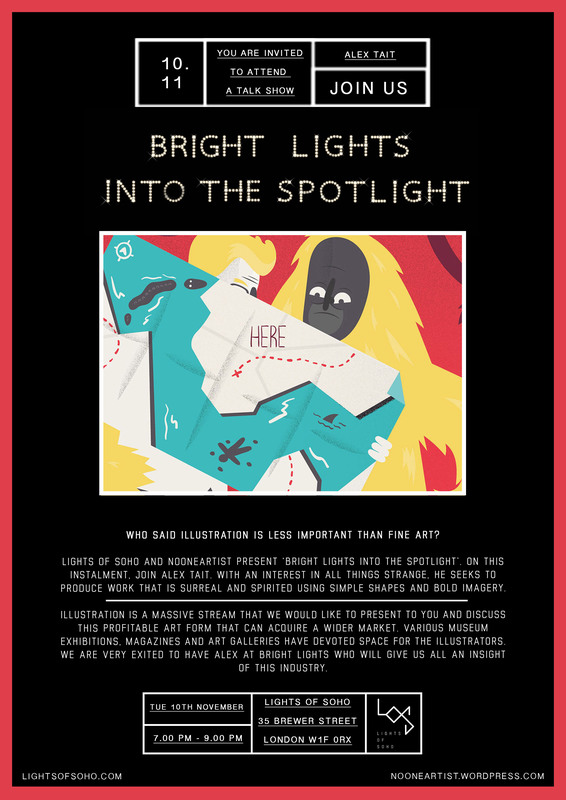 ‘Bright lights into the spotlight’ talk with Alex Tait on Tuesday 10th November. Nooneartist and Lights of Soho gallery are happy to present such kind of event that can be helpful for a young generation. The evening will be marked by an interview with talented artist where you will have an opportunity to talk with him. The evening will commence with a private drinks reception from 7.00 pm, followed by the interview at 7.30pm, with ample time being given for Q&A. Tags: art, artist, artists, bright lights, creative, design, event, event london, famous, gallery, graphic, graphic design, illustration, illustrator, into the spotlight, lights of soho, london, soho, spotlight, talk. Bookmark the permalink.